Dal is a staple and often eaten in the homes of Gujarati families, its aroma never fails to bring back wonderful memories from my childhood. For me, it evokes Hindu temple kitchens, wedding celebrations, visiting family and being surrounded by loved ones. My mother showed me how to cook the perfect dal, teaching me which spices to use and in what proportions. 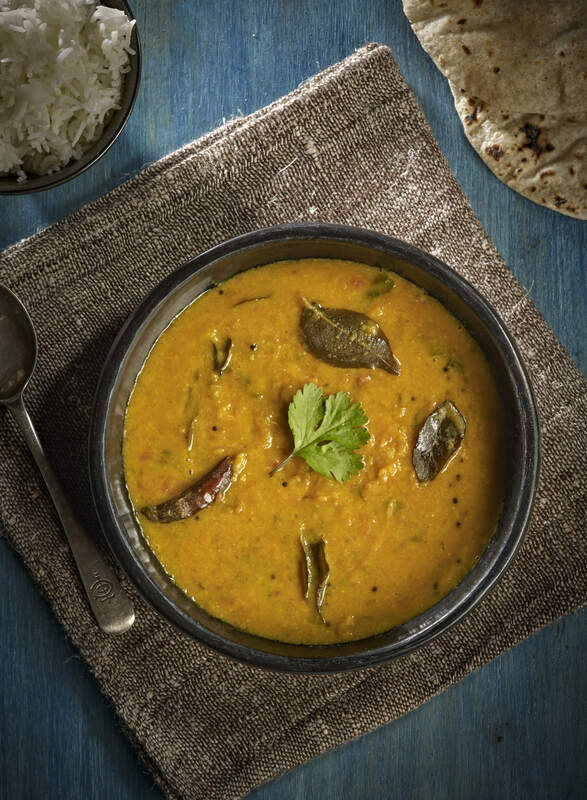 Masalo is added to the dal to form a staple soup, bringing together the right ingredients to perfect the dish. When made correctly, its flavour is fresh, clean and perfectly balanced with sweet, sour, salty and spiced flavours. My family would eat dal throughout the week, Saturday afternoon with a range of vegetarian curries, buttery basmati rice and a cooling cucumber raitu. Ingredients toor dal, Tomato, chillies, jaggery, lemon, mixed blend of spices, coriander. contains mustard .